Not a great deal to report I'm afraid by the junior galley slave on Nb Dulwich Dishwasher. It seems that Scottish Waterways are in a partnership project between themselves, the Scottish Wildlife Trust and the Royal Zoological Society of Scotland. I chanced upon Angus McCoatup (street philosopher) selling the 'Pig Issue'. He said Scottish Waterways have taken a march on the Cycling Angling Rambling Trust. Scottish Waterways have been providing some assistance in reintroducing various kinds of wildlife to their inland waterways. Water Voles are considered to be small cheese. Even Beavers have been reintroduced into the Scottish waterways. Not to be outdone, Alvin 'buster' Spotte the trust environmental scientist is still promoting the reintroduction of voles. Which have been predated into extinction by the mink. In an effort to cull the numbers of mink he wants to reintroduce a couple of top level predators. In the form of two types of long extinct bear. As you might expect there has been a bit of a furore created by the usual vociferous boaters. But as suggested by Ally Slash it seems that the trust now discounts boaters from amongst its target clientele. After conducting a two hour consultation with all the interested parties and conservationists in the bar of the 'Gusset and Flies'. The trust has gone ahead with a small scale reintroduction of Water voles and the two types of bears. The trust is now installing advisory notices on visitor moorings and along several sections of river and canal such as the Kennet and Avon. In particular places with a high number of overstaying boats. Other areas include sections of the Rochdale Canal where the bears are expected to integrate well alongside the existing wildlife. "We currently advise all cyclists, anglers and ramblers to wear high visibility, stab proof clothing similar to the type we provide for our staff and volunteers. We also advise all cyclists, anglers and ramblers to wear noisy little bells on their clothing. To give a pre-warning, so as not to startle bears that aren't expecting them. 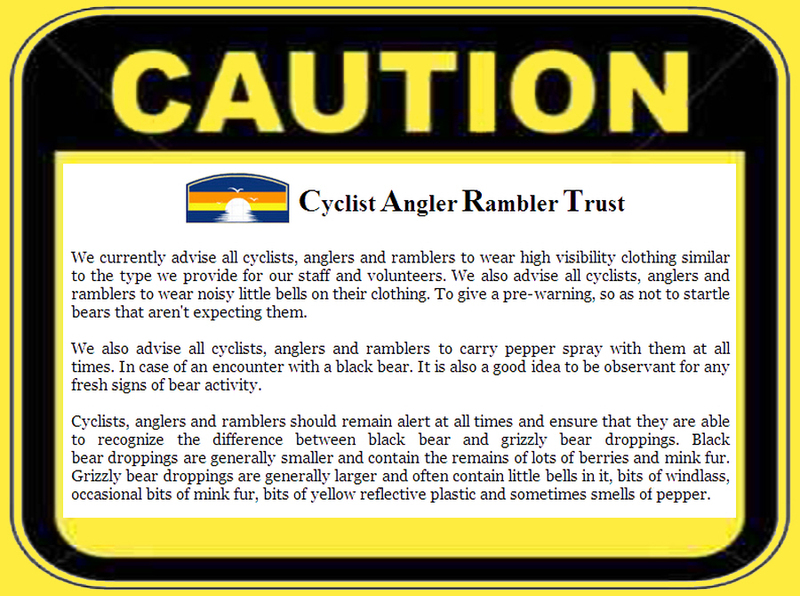 We also advise all cyclists, anglers and ramblers to carry pepper spray with them at all times, in case of an encounter with a grizzly bear. It is also a good idea to be observant for any fresh signs of bear activity. Cyclists, anglers and ramblers should remain alert at all times and ensure that they are able to recognize the difference between black bear and grizzly bear droppings. Black bear droppings are generally smaller and contain the remains of lots of berries and mink fur. Grizzly bear droppings are generally larger and often contain little bells in it, bits of windlass, occasional bits of mink fur, bits of yellow reflective plastic and sometimes smells of pepper." I bumped into Marina 'nails' Clout (office cleaner) in the tap room of the 'Ferret and Finger'. She was her normal ebullient self. Nails, told me a wonderful story that's doing the rounds. Apparently the Inner Sanctum, back orifice volunteer was busy doing a bit of cold calling trying to get some donations. The Cyclist Angler Rambler Trust database highlighted that the trust had never received a donation from one of Londons most successful Silks. As the Trust had put plenty of work his way. The volunteer in charge of contributions, cold called him to try and persuade him to contribute. The volunteer said "Our research shows that out of a yearly income of more than £600,000 you have not donated a penny to charity. Wouldn't you like to give a donation to the Cyclist Angler Rambler Trust in some way?" The Barrister mulled this over for a moment and replied. "First, did your research also show that my mother is dying after a long painful illness, and has medical bills that are several times her annual income?" Embarrassed, the volunteer mumbled, "Um er, No." The Barrister then said "Second, to that my brother, a disabled Afghanistan veteran is blind and is now confined to a wheelchair?" The stricken volunteer began to stammer out an further apology. But he was put off when the Barrister said "Third, that my sister's husband died in a traffic accident." Then with the barristers voice rising in indignation, he added "Leaving her penniless with three children?" The now humiliated volunteer, completely beaten, said "I had no idea..." Now that he was on a roll, the barrister cut him off once again, "and seeing as I don't feel the need to give any money to them, so why should I give any to you?!" The Memsahib has paid another visit to the Khan corner shop, boat yard, sandwich bar and now its opened up as a lettings agency. Looks like the entrepreneurial Khan has discovered another way to make a few quid. He is expanding the close season for his hire boat business into short term winter accommodation.